There are many strange airports in the world. I once went to a one room airport in southern Alaska where the baggage claim was simply a hole in the wall through which a two man bag crew threw assorted pieces of luggage. I remember as a young child going through Frankfurt’s Fraport, where a tunnel lit by rainbow gels funneled passengers down a moving walkway with ascending tones mirrored their progression, as if they were walking on a giant piano. Years later, during the 2006 World Cup, the same airport had free foosball tables every 25 meters throughout the terminals encouraging straggled travelers to brighten their day with some play. It’s hard to say exactly which was the best airport I’ve ever visited, which was the worst, the biggest, the smallest, which had the best restaurants. But without a doubt the weirdest airport I’ve ever been to is the Denver International Airport. Denver’s airport, much like the city it occupies, is an interesting and strange creation only possible in the United States. As one walks around DEN, they’ll notice one or two strange things, then one or two more, until suddenly it seems they are in the midst of a massive conspiracy. And conspiracy is one word that comes to best define the strange and wonderful there. Although these conspiracy theories have little or no basis in fact, I will enumerate them here at their believer’s best, as then they’re the most fun and also the most encouraging to my point of demonstrating weirdness. The Denver International Airport was completed in 1995 to replace the city’s old airport, Stapleton which was apparently fully functional at the inception of the former. This is where the weirdness starts. And then there’s the art: usually an airport’s art selection will be lackluster. There’s the occasional surprise like the xylophone hall mentioned above, but in general it tends to be bland, inoffensive, and uninspired. Not the case in Denver. The first, and most obvious offender against taste is the Mustang sculpture by Mexican artist Luis Jiménez. A 32-foot tall statue of a ferocious cobalt blue mustang rearing up, it is the first thing you see after leaving the airport. Terrifying in its intensity and odd color, the effect is heightened by the piece’s glowing red eyes. Yes, the giant scary mustang statue’s eyes glow, and it turns out it’s not just an empty threat. Did I forget to mention? While working on the statue, the massive head of the horse came undone and fell on poor Luis and killed him. Nearby the Mustang statue is an inexplicable 26-foot tall statue of Anubis, the Egyptian jackal-headed god of death and the underworld. This one is really beyond any logic for me. The terrifying horse watches over it’s whitebread domain with glowing eyes. Here’s Anubis– apparently at Christmas time. Then come the murals. 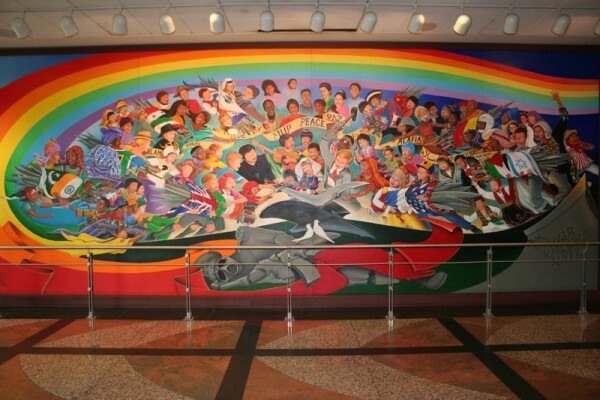 At the baggage claim of DIA are a series of murals by artist Leo Tanguma, which depict horrifying events and dead children, while a gas mask clad soldier with a saber rules over a multiracial populous. In the background of one of the pieces, people run in excruciating pain from the inferno of a nuclear holocaust, as children are laid to rest in solemn coffins below. In the foreground twisted faces mourn and cry the brutal and senseless loss of life. Conspiracy theorists claim it shows the consequences of the New World Order, while Tanguma argues it shows humanities remarkable ability to bounce back to peace despite unimaginable tragedy—a likely story. One of the creepy murals. So there you have it, the Denver Airport is almost certainly a headquarters for the Lizard people who control the world and will set about a New World Order. On a serious note, even with all these conspiracy theories disproven, it’s entirely impossible to deny the varying degrees of weirdness that populate its every detail.